After a couple of days without actually watching too much tennis on court, I ventured out for the evening session on Rod Laver Arena tonight, to witness a flawless performance from Petra Kvitova and Rafael Nadal in imperious form. While I was out there, a couple of the unanswered questions from Sunday’s Q&A blog came to mind, so I thought I’d answer them here. What are Australian tennis fans like? Knowledgeable. I was really struck by the way they respected Petra Kvitova, particularly after she’d just beaten their favourite. The fans definitely knew her backstory, giving her a huge ovation when Jim Courier asked her if she’d ever doubted whether she’d be able to reach a Grand Slam semi-final again. The moment brought Kvitova to tears and was deeply touching. She’s really loved in the sport, and I hope she knows that. 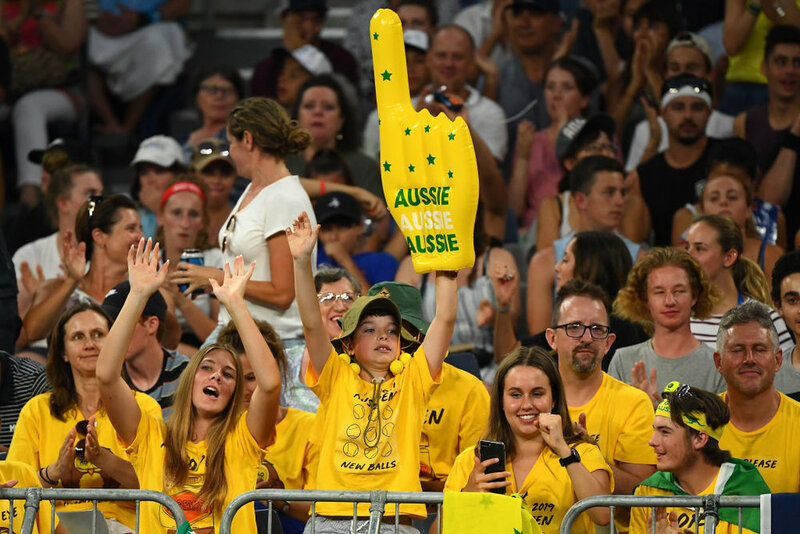 Besides this, I think Australian tennis fans are the only ones who bring a Davis Cup vibe to their support. There are always large groups of fans who put on the green and gold, come up with a fairly naff song, and act as a kind of power bank for the rest of the crowd, energising them throughout. Who is the most impressive player to watch in the flesh vis-à-vis on television? I’ve always thought the answer to this question is Nadal, and this evening’s experience reconfirmed that belief. His shots have such impact, pounding off the surface and pushing opponents back. Up close, you see how physical his tennis is, and I think you get a better sense of how aggressive he tries to be, particularly when he’s in a ravenous mood like he was tonight. One of the moments of the tournament came on the opening day, when Katie Boulter forgot the new final set tiebreak rule (it’s to ten now, folks) and celebrated victory prematurely. It was amusing and concerning in equal measure; Boulter went on to win and laughed it off, but it did perhaps suggest that the new rule hadn’t been communicated effectively enough, and it justified the concern about different final set scoring systems potentially causing confusion. And it turns out that it’s not just the new tiebreak rule which is discombobulating players and affecting matches. Did you know that in the junior events the no-let rule is in place? I didn’t. And neither, apparently, did Australian fifth seed Rinky Hijikata. On match point today, his opponent Zane Kahn hit the tape with his second serve and, rather than returning it, Hijikata simply patted the ball into the ground as though he was waiting for another bite at the cherry. No such luck. He lost the match there and then. Ouch. The longest press conference of the tournament to date has been held by… Patrick Mouratoglou. Most transcripts are two pages long, some spill over onto three pages. As for Patrick, well, he managed four pages. I suppose this is hardly surprising – he’s never one to turn down an opportunity to speak in front of the cameras. (Interestingly, Tsitsipas says that Mouratoglou is more laconic in private). What’s a little more surprising is the fact he was giving a press conference at all. But, in an admirable initiative, the WTA has been allowing members of the media to speak to the coaches of winning players this week. It’s a something they’ve done before, in Cincinnati and Singapore last year, and it works well. While they’re unlikely to reveal their tactics, coaches are usually more open to insightful technical discussion than players, and they offer a new perspective. I popped over to the Rod Laver Arena for the beginning of Danielle Collins vs Anastasia Pavlyuchenkova this afternoon. Three games, about a billion deuces, and multiple break points later, I was finally allowed in. The 25 minutes I spent waiting in the gangway was longer than the entire Serena vs Halep first set, and only three minutes shy of the shortest match in ATP Tour history (Nieminen vs Tomic). And it got me thinking: is this really a good thing for tennis? At the US Open, fans in the upper bowl of the Arthur Ashe Stadium can come and go whenever you like, likewise at the Next Gen Finals if you’re seated at the side of the court. Giving spectators the freedom to roam around during games has its downsides, but allowing it in certain areas of the stadium has got to be better than denying all ticket holders access to their seat, hasn’t it? Q. Li Na, can you imagine being in a position or situation of playing, traveling with a family, like Vika has done, Serena? LI NA: No chance (smiling). I can travel with my children, but perfect is without the husband (laughter). I don't think he can help now. So, yeah, I was talk to friend this morning. If I want a vacation, without a husband, that was the perfect vacation. Why is it common practice for female players to return their opponent’s serve during the warm-up, but not for male players? With Tsitsipas’ win today, it’s now back-to-back years that the Next Gen Finals winner has reached the Australian Open semi-finals the following year. Tsitsipas follows in Chung’s footsteps. For a further bit of symmetry, they both got there by beating the masters of their style in the fourth round. Chung took his baseline game to Djokovic and won, while Tsitsipas beat Federer with an all-court approach. Here are the eight semi-finalists from the men’s and women’s singles at last year’s Australian Open: Federer, Cilic, Edmund, Chung, Wozniacki, Halep, Kerber, Mertens. All of those players were eliminated from this year’s event before the quarter-final stage. Make of that you will, but the completely different line-up certainly underlines the incredible depth in the sport. It’s also a reminder that so much can change in a year. There’s a tendency to draw hasty conclusions, to treat what we see here and now as the new reality, but that’s not always the case. Anastasia Pavlyuchenkova was beaten today. When I saw she was unseeded at the start of this tournament, I assumed it was some kind of a mistake. Indeed, she had been seeded at every Grand Slam before this one since Wimbledon 2015. Anyway, she must absolutely hate the quarter-finals. Her loss today meant she’s now 0-5 in the last eight of Grand Slams singles events, and she has an identical record in doubles. One of the things which separates the Australian Open from the other Grand Slams is its proximity to the city centre. I’m staying in the Central Business District and can walk to Melbourne Park in 30 minutes. The closeness was emphasised this evening on the Rod Laver Arena as the Mumford and Sons concert from across the Yarra River at the nearby Sidney Myer Music Bowl could easily be heard on court.